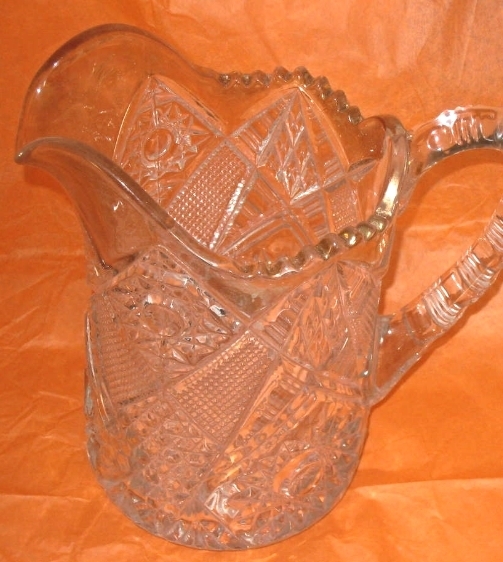 This Collectible 7 1/2 inch pitcher is completed in cut glass, star medallion and hobnail patterns. It has gold carnival treatment lightly emblazoned on the top edges. The gold carnival treatment has age related fading that adds to its character and collectability. Manufacturer: Imperial Shipping note. It is my policy to refund any excessively calculated shipping on the day of shipment using the same method as payment.